At first, it looks like some sort of horrible, fuzzy mold, about to devour your newly germinated seeds. But when you get really up close, it turns out to be superfine, hairlike extensions growing from the radicle. These kale sprouts pushed themselves right out of the seedling mix, probably because they weren’t pressed in and covered deeply enough. Kale, broccoli, cauliflower and other brassicas do this in a very visible way during a surface emergency, sending out a mass of fine root hairs in search of water. 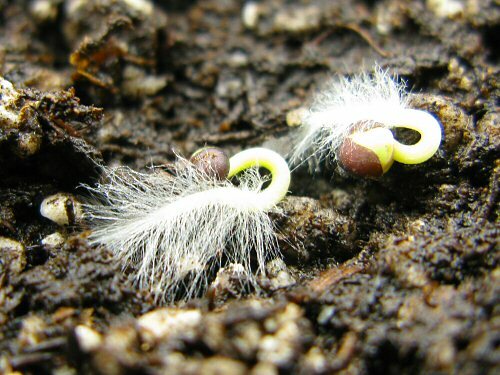 Root hairs are normal below ground, but I’ve only really noticed them growing exposed on brassicas, other newly emerged seedlings with bared roots usually seem to just dry up. An unusual glimpse of what plants are up to with their vast root systems down below. Given half a chance—a little surface moisture—these guys can actually manage to burrow down and root themselves. Pretty cool trick. I think you’ll find they do this when they are underground too – I studied it in Botany class a few years ago (at university). This way the plant can vastly increase the surface area from which to absorb water & nutrients. They are so easily damaged though you rarely see them on plants in the ground – by the time you get them out of the soil they have all been pulled away. What a cool picture! I’ve never seen seeds do that before…..yesterday finally it was time to start seeds inside. I did peppers and cabbage. I can’t wait to get into the garden! So, I have never grown anything and growing kale for the first time, starting it inside it is doing this same thing. Do I need to water them?